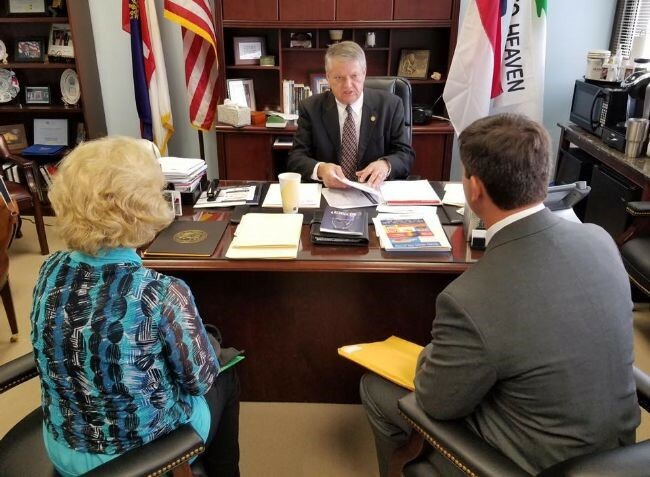 Last week, 175 representatives from North Carolina’s electric cooperatives gathered in Raleigh to meet with their legislators in the General Assembly and discuss policy issues important to electric co-ops, their members and their communities. More than 80 state legislators participated in the event. Carteret-Craven Electric Cooperative Board President Deloria Irby and CEO Jake Joplin talk with Sen. Norman Sanderson during the Rally in Raleigh. During the meetings, co-op leaders advocated on behalf of the newly filed broadband bill in the House and the Senate (House Bill 387 and its companion legislation, Senate Bill 310). The legislation would allow co-ops to seek U.S. Department of Agriculture funding for broadband projects; would exempt broadband activities from a requirement that co-op business ventures fully compensate the co-op for the use of personnel, services, equipment and property; and it would facilitate broadband services to be provided through existing easements. Through conversations with legislators about the legislation, electric co-op representatives secured 92 co-sponsors in the House and 42 co-sponsors in the Senate. See photos of co-op meetings with legislators on Facebook using the hashtag #RallyInRaleigh.